Laura Stevens has had several busy summers studying west Greenland’s Sarqardliup Glacier. Located south of Ilulissat, the glacier’s Sarqardleq Fjord connects with the Jakobshavn Glacier, one of Greenland’s fastest moving and most productive glaciers in terms of iceberg yield. Despite Sarqardliup Glacier’s proximity to Jakobshavn, Sarqardleq Fjord remains relatively ice-free in summer months, which offers a unique opportunity to study the entire Sarqardliup Glacier/Sarqardleq Fjord ice-ocean system. Stevens, a second-year graduate student in the MIT-Woods Hole Oceanographic Institution Joint Program, and colleagues initially selected the Sarqardleq Fjord for their 2012 and 2013 fieldwork for convenience; the fjord sits downstream from a WHOI-funded 2011-2014 project. This choice served them well. A National Science Foundation grant for 2012-2013 let the group leverage the 2011-2014 project while providing the opportunity to study the entire glacier system from top to bottom. Stevens, who works with veteran Research Scientist, Sarah Das (WHOI) says the project’s interdisciplinary collaboration sets it apart. “All of our specialists, including glaciologists, oceanographers, and engineers, work together to try and understand the whole glacier system while also working to improve our technology,” she says. That technology, engineered at WHOI, includes the REMUS (used in 2012) and JETYAK, two autonomous vehicles, each outfitted with an oceanographic instrument suite. 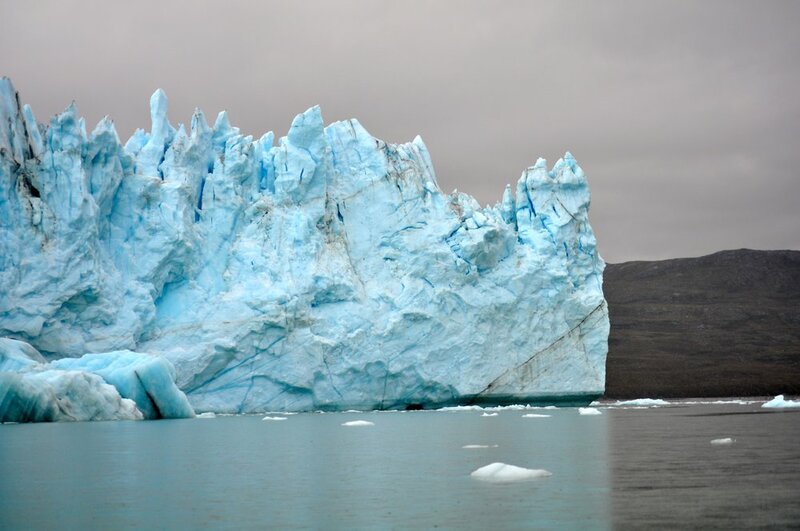 With the help of a skilled operator working from a nearby boat, the vehicles can make detailed measurements within 100 m of the glacier face, a proximity that is too dangerous for small vessels because of the potential for calving ice, but essential for understanding ice-ocean processes. In July, 2013, Stevens and a team of six spent ten days studying where Sarqardliup Glacier enters the ocean. The scientists made oceanographic observations from two fishing vessels hired from the tiny hamlet of Iliminaq, just south of Ilulissat. Before heading out for the day the group split into three teams. One team readied the JETYAK, which Stevens describes as a “big yellow kayak with a jet-ski engine.” Each morning the JETYAK batteries had to be charged and in place for five to six hours of continuous operation. From one vessel, the team deployed the JETYAK, outfitted with ins­truments that measure water temperature, depth, salinity, and water velocities. Sidescan and multibeam sonars affixed to the JETYAK mapped the ocean floor topography. The second team prepared the second boat for traditional oceanographic surveying. With a similar instrument suite affixed to the boat, the team surveyed down-fjord and duplicated some JETYAK surveys for quality control. The last group spent time studying nearby glacial features, hiking and helicoptering to various sites, including small lakes along the edge of the glacial valley. 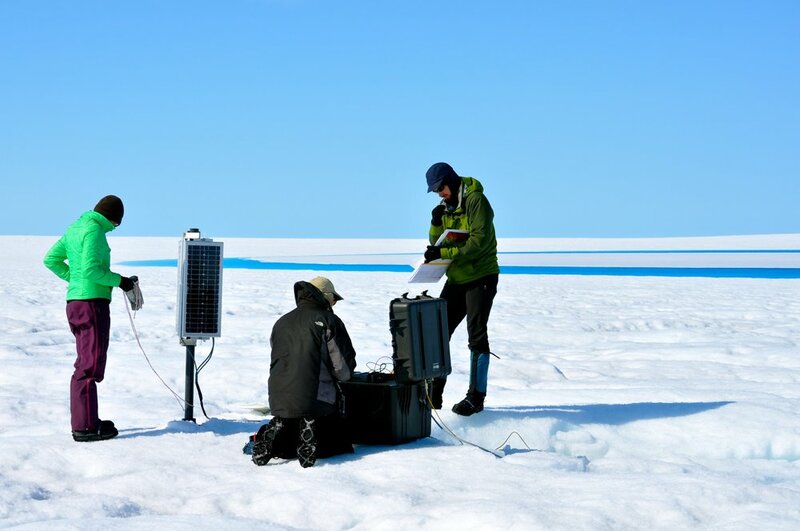 2013 fieldwork also focused on three blue meltwater lakes higher up on the ice sheet, about 30 km from the glacier front. The lakes, spaced about 5 km apart, were chosen as study sites following satellite imagery analyses. Examination of many years of images showed that the lakes accumulate meltwater during the summer and periodically drain downward into the ice. Stevens and colleagues are interested in how supraglacial lakes and their moulins, drainage conduits, form. They hypothesize this happens through a process called hydraulic fracturing wherein water propagates fractures down through the ice to the bedrock. They hope to understand the geometry and speed at which fracturing occurs by observing ice surface changes during supraglacial lake drainage events. Scientists believe that the water that makes it to the bed helps lubricate the nearby ice sheet, thereby increasing the local velocity and subsequent delivery of ice to the ocean. “We also have pressure sensors in the lakes that allow us to track when the lake level begins to drop. Are drainage events initiated by cracks that start directly beneath the lake and propagate through the ice to the bedrock, or do there need to be crevasses already present to initiate drainage? This is what we are trying to understand,” says Stevens.